Wrexham chief executive Don Bircham says the club are hopeful of having a new manager in place before the end of the season. Kevin Wilkin was sacked after only a year in charge of the Conference club. Caretaker boss Carl Darlington has said he does not want the job on a permanent basis. "We're down to eight to ten, they are good, solid candidates and the best qualified for the job. They have to be," Bircham told the Evening Leader. "We will have a meeting after all the interviews and it is highly likely we will go to a second interview with a reduced number. "We're aiming to have someone in place by the end of the season." Former Nuneaton manager Wilkin was sacked 24 hours after losing to North Ferriby United on penalties in the FA Trophy final at Wembley on 29 March. Wrexham's last game of the Conference season takes place on Saturday, 25 April away to AFC Telford. 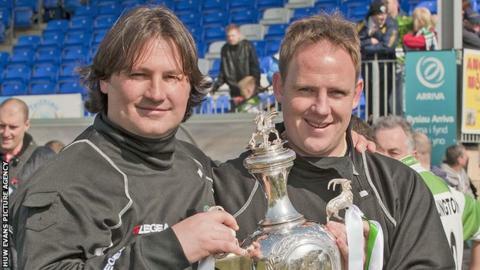 New Saints manager Craig Harrison is among the favourites to succeed Wilkin and says he is flattered to have been linked with the vacant managerial position. The former Middlesbrough, Crystal Palace and Preston North End defender has led the Saints to four Welsh Premier League titles and two Welsh Cups since being appointed in 2011. Darlington, unbeaten in three games as caretaker manager, worked alongside Harrison at the Oswestry based club before accepting the first team coach role at Wrexham in December 2014.